Craig Mound as it appears today at the site of Spiro in eastern Oklahoma. In the early 1930s, commercial looters tunneled into this mound and discovered a gaping hollow, the tomb-like shell of an intentionally buried mortuary structure. Inside were elaborate special burials and jumbled human bones accompanied by unbelievable quantities of unusual artifacts made of marine shell, exotic stone, bone, copper, feathers, fabrics, fur, and all manner of materials. Photo by Dee Ann Story. Spiro and the Arkansas Basin in relationship to the main Caddo Homeland and the Trans-Mississippi South biographical zone. Base map by Erwin Raisz. Click on image for enlarged view. Reconstruction of a large rectangular house at Spiro. This reconstruction is on display at the site, now an Oklahoma state park. Photo by Dee Ann Story. This unique human effigy pipe, depicts a naked man with a larger-than-life head holding the head of a deer to the ground in his left hand and a fringed object in his right hand. 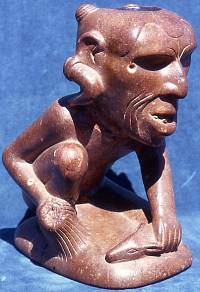 The pipe is made of red flint clay from a source near St. Louis, Missouri not far from the great Mississippian center of Cahokia. 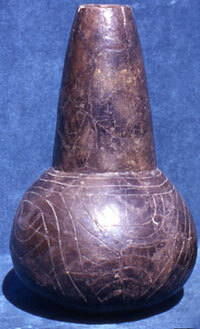 Thomas Emerson and colleagues believe this pipe may be a hierloom item that was originally made for use at Cahokia. Their hypothesis is that this and similar ritual items left Cahokia in the late 13th century as the center's power waned to be reused at ascending centers like Spiro. Height 23 centimeters (9 inches). Courtesy Robert Bell and the Sam Noble Oklahoma Museum of Natural History, University of Oklahoma. 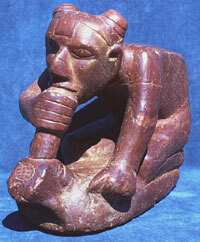 Effigy pipe of male figure crouching and smoking what appears to be (upon close inspection) to be a frog effigy pipe. Made of red flint clay from near Cahokia. The pipe is 20.5 centimeters high and 36.5 centimeters long. Click to enlarge and see back of pipe. Courtesy Robert Bell and the Sam Noble Oklahoma Museum of Natural History, University of Oklahoma. 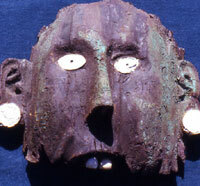 Wooden mask with marine shell inlays from Craig Mound, Spiro. The mask was carved from red cedar and apparently was once covered with sheet copper. Courtesy Robert Bell and the Sam Noble Oklahoma Museum of Natural History, University of Oklahoma. Spiro Engraved bottle and Crockett Curvilinear-Incised bowl from Craig Mound, Spiro. 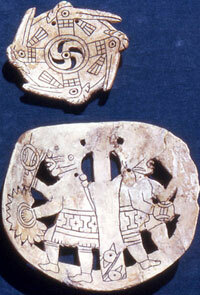 Both vessels are almost certainly Caddo vessels, probably obtained from Red River Valley. Courtesy Robert Bell and the Sam Noble Oklahoma Museum of Natural History, University of Oklahoma. Bois d'arc (Osage orange) wood, one of the best bow-making woods in North America, was traded far and wide from its only source, a small area of the Caddo Homeland near the Red River above the Great Bend. Photo by Frank Schambach. Spiro's wealth is almost certainly a consequence of its strategic position as a "gateway" community and trading center between the Mississippian world to the east and the Great Plains to the west. 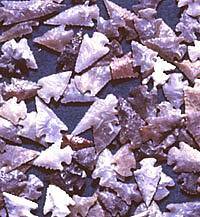 Caches of arrow points were common offerings in Craig Mound. These are Agee points made of novaculite and other materials. Courtesy Robert Bell and the Sam Noble Oklahoma Museum of Natural History, University of Oklahoma. 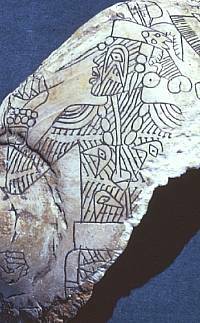 Engraved image of tatooed man on marine shell cup from Craig Mound. Courtesy Robert Bell and the Sam Noble Oklahoma Museum of Natural History, University of Oklahoma. Just to the north of the main Caddo Homeland lies the mound center of Spiro in the Arkansas River valley in extreme eastern Oklahoma. Spiro was the westernmost of the primate (main) centers in the Mississippian world during the 12th through mid-15th centuries (A.D. 1100-1450). Spiro was certainly not anywhere near as large or powerful as Cahokia, the largest town and political capital in prehistoric America north of Mexico. But Spiro is famous for the unprecedented amount of wealth that was accumulated by its leaders and buried with them. In 1933, local entrepreneurs formed the "Pocola Mining Company" to loot Craig Mound, the site's largest mound. Craig Mound was actually four connected mounds, a large cone-shaped one and three smaller ones. Digging by hand with no real idea of what they were digging into, the looters made relatively slow progress for the first year. They did encountered many graves and offerings in the smaller mounds and these began to appear on the market. This eventually provoked a public outcry and Oklahoma passed one of the first state laws protecting antiquities in 1935. Unfortunately, the looters were able to continue digging secretly and finally struck upon an effective way of getting what they wanted: they hired coal miners to tunnel into the largest cone. The main tunnel into the center of the mound encountered a gaping hollow, the shell of a purposefully buried mortuary building. Inside were elaborate special burials and jumbled human bones accompanied by unbelievable quantities of unusual artifacts made of marine shell, exotic stone, bone, copper, feathers, fabrics, fur, and all manner of materials. Many of these items represent ritual paraphernalia linked to the Southern Cult (Southeastern Ceremonial Complex). As their lease expired and as state authorities moved to shut down the operation, the Pocola miners tried to blow up the rest of the mound in a fit of pique. Although they failed, the damage they had already wrought is one of the greatest tragedies in American archeology. The whole and partial artifacts were quickly sold off and wound up in dozens of museums and private collections around the country. The 1936-1941 WPA archeological excavations by the University of Oklahoma salvaged many pieces and much information. More recent work at the site and thorough analyses of the spectacular collections have made Spiro one of the most important archeological sites in North America. Spiro was not an isolated place, but was instead at the top of a hierarchy of settlements within the Arkansas Basinwest and north up the Arkansas River and its tributaries draining the southwestern Ozark Plateau and adjacent tall-prairies to the west. Related sites are said to occur within the White River drainage in southernmost Missouri. During the Harlan phase (A.D. 1000-1250), Spiro was a ceremonial and population center. After A.D. 1250, the residential population moved to other sites in the area and Spiro was used only as ceremonial and mortuary center. The site's role as a mortuary center peaked in the Norman and Spiro phases (A.D. 1250-1350 and 1350-1450, respectively). After A.D. 1450, the site ceased to play an important role in the region, possibly because east-west trade routes shifted southward through the Red River valley. Spiro's wealth is almost certainly a consequence of its strategic position as a gateway community and trading center between the Mississippian world to the east and the Great Plains to the west. Spiro is thought to have served in much the same way as did St Louis, Missouri in the 18th and 19th centuries: as a crucial hub through which most east-west commerce and traffic had to pass. In Spiro's case, the nature and substance of the trade is debated. 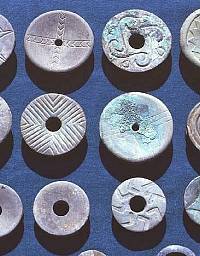 Some argue that Spiro was at the center of a trade system that moved relatively large quantities of economically useful materials including food, clothing, and weapons. In contrast, other scholars think that Spiro trade amounted mainly to exchanges between leaders of ritual items related to the Southern Cult. The view here is that Spiro trade almost certainly had both economic and ritual importance. At Spiro, most of the exotic materials come either from the local region (including the main Caddo Homeland to the south) or from distant sources far to the east. Among the distant sources are those in the Midwest around Cahokia and across the Southeast, including the Appalachian Mountains (Tennessee-Kentucky area) and the northeastern Gulf coast (Florida-Mississippi). It is somewhat less clear what was moving from the opposite direction from the Great Plains that would attract this great wealth from the Eastern Woodlands. Grave145 in Craig Mound had strings of shell beads that had a total of almost 14,000 beads made from dwarf olive shells from the Gulf of California. Some of the garments found at Spiro are made of bison hair, jack rabbit fur, and cotton fiber. These hint that most of what was moving west-to-east may have been of perishable material. Frank Schambach argues that dried bison meat and bison hides were the principal items moving east from the Plains. Further, he believes that Spiro also controlled the trade in bois d'arc wood and finished bows obtained from the Red River valley in the core of the Caddo Homeland. Bows and bow wood would have been highly desirable to both the bison hunters on the Plains as well as the warriors and hunters of the Mississippian world to the east. This brings us back to the question of who the Spiroans were and how they relate to the Caddo groups along the Red River and elsewhere in the main Caddo Homeland. Although Spiro and its Arkansas Basin hinterland has long been known to archeologists as the "Northern Caddoan Area," the ethnic/linguistic identity of the Spiroans is debated. 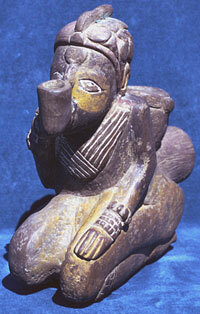 The four possibilities that have been advanced include: the ancestors of the Caddo, Kitsai, Wichita, and Tunica. The main reason the debate lingers is because of the break in the cultural sequence of the Arkansas Basin. Following the demise of Spiro as an important center by A.D. 1450, the succeeding Ft. Coffee phase (A.D. 1450-1650?) is said to evidence some cultural continuity with Spiro's heyday but also changes, such as a shift to circular houses (from rectangular). Other changes, such as the use of underground storage pits, are said to reflect a western orientation toward the Plains. While most authorities think the main east-west trade routes shifted south through the central part of the Caddo Homeland, Schambach argues the Spiro area still served as a gateway community after the demise of the site as a major center. By the time French traders entered that part of the Arkansas Valley in 1719, Spiro was long abandoned and the area was essentially unoccupied. Farther up the Arkansas River the French found villages and camps of Wichita and Kitsai groups, both speakers of Northern Caddoan languages. Yet, the lifestyle of these peoples as observed by the French was very different from that of the Spiroans. Were these Northern Caddoan peoples the descendants of the Spiroans? And what about the strange people of the province known as Tula that the De Soto expedition encountered in 1542 somewhere along the lower or middle Arkansas River? Parallels between the Arkansas Basin and the Caddo Homeland to the south have caused generations of archeologists to believe that the two areas are part of the same "Caddoan" cultural tradition. This interpretation was built partly on the finding at Spiro of many finely engraved pots, particularly of the style named Spiro Engraved, during the WPA excavations there in 1936-1941. Since the engraved pots are clearly of the Caddo ceramic tradition and it was assumed that they were made at Spiro, then Spiro was seen as being part of the Caddo tradition. But it is now recognized that many of these Caddo-like pots at Spiro are indeed Caddo pots that come from the main Caddo Homeland, not the Arkansas Basin. Spiro Engraved, for instance, was almost certainly manufactured in the valley of Red River. This realization has done little to alter the notion that Spiro was part of the Caddo tradition. The combined region and culture has been called, variously, the Caddoan Area, the Caddoan Cultural Tradition, and the Caddoan Mississippian culture based on the assumption that the entire area was populated by the ancestors of Caddo-speaking groups. But the obvious dissimilarities (including different mortuary practices, different dominant house forms, and distinctive skeletal characteristics) have led to uncertainty about this all-Caddo notion. Despite many similarities, the Arkansas Basin cultures were distinct from those in the main Caddo Homeland for at least 600-800 years (roughly A.D. 800-1600). Some archeologists believe the parallels between the two adjacent areas are more important than the differences. They point to the fact that within the main Caddo homeland itself there is considerable diversity from local area to local area. Archeologist Ann Early, who has worked extensively in the Ouachita Mountains, sees many similarities between Caddo sites in that area and those in the Arkansas Basin. For instance, square and rectangular structures (often temples or other special buildings) are common at Late Caddo sites in the Ouachita Mountains. (Rectangular buildings are also found widely farther south in east Texas, but they are vastly outnumbered by circular structures.) 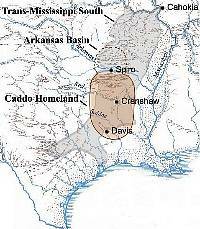 Early and other archeologists hypothesize that, after the demise of Spiro as a major population and ritual center in the mid-15th century, the local (presumably Caddo-speaking) people may have begun migrating south and east into the nearby Ouachita Mountains. Or perhaps, as some archeologists have argued, the Spiroans were the ancestors of one of the tribes that are closely linguistically related to the Caddo. The Kitsai and Wichita have been singled out as the most likely candidates, but not very convincingly so. If these groups were the descendants of Arkansas Basin peoples, why were their cultures so different in so many important ways from that of Spiro? 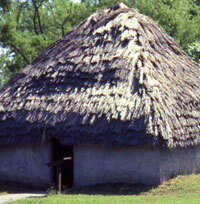 For instance, the Wichita were known throughout historic times for their round, beehive-shaped grass houses quite similar to those characteristic of the early historic Caddo. Yet, Spiro houses were square or rectangular with four- or two-post central roof supports and an extended entranceway, a very different architectural tradition. Similarly, Wichita pottery seems to have been part of the Plains tradition of cord-marked utilitarian wares, not the engraved fine wares of the Caddo tradition. Oklahoma archeologists Charles Rohrbaugh and Don Wyckoff think a better case may be made for the Kitsai. They see parallels between the post-Spiro Fort Coffee phase (ca. A.D. 1450-1600) in the Arkansas Valley and historic village sites along the Grand River that have been linked to the Kitsai. Unfortunately, so little is known for sure about the history of the Kitsai that the Spiro-Kitsai hypothesis has yet to be confirmed. The most controversial (and intriguing) suggestion is that the Spiroans were neither Caddo nor Caddoan, but the ancestors of the Tunica tribe of the lower Mississippi Valley. Frank Schambach's hypothesis is that the province of Tula that De Soto's army attacked in 1542 was at or near Spiro and that the Tulans were one and the same as the archeologically known Spiroans. He argues that the descendants of the Spiroans are the Tunica. From the late 1600s onward the curious history of the Tunica is well known. The Tunica were closely allied trading partners with the French and served as middlemen through which guns and trade goods moved west in exchange for horses, furs, and hides. They were unequivocally identified first in the late 1600s on the lower Yazoo River, just upstream from where the Arkansas meets the Mississippi. From there they repeatedly moved their villages down the Mississippi in response to epidemics and trading opportunities. Schambach's full argument is too complex and lengthy to be presented here. Basically, he thinks the Tunica were far more than mere middlemen and were active long-distance traders who operated a vast trading network during the 18th century that linked the Southern Plains, the Caddo Homeland, and the lower Mississippi. This network is said to represent a continuation or evolution of the one established 600 years earlier by the ancient Spiroans. Part of the evidence involves a peculiar type of cranial deformation caused by binding the heads of infants such that their heads became pointed. The deformed heads of the people of Tula horrified the Spanish in 1542. Archeologically this trait is said to be present at Spiro and at the Sanders site on the Red River, which Schambach argues was a subsidiary trading center linked to Spiro. It has yet to be established that the Tunica had this particular form of deformation, although one French account may suggest that this was so. Schambach speculates that these grotesque heads would have given the traders instant recognition, an advantage when traveling through the territories of other groups. While the Tunica hypothesis is fascinating, it based on a string of tentative inferences that may not withstand rigorous analysis. Schambach's argument has not won over the leading researchers who have worked in the Arkansas Basin. They apparently reject the idea entirely, but have yet to counter the argument forcefully in print. The Tunica hypothesis is also rejected out of hand by the Caddo and Wichita tribes; both tribes claim Spiro as part of their ancestral realm. And here is where we will leave the questions of who the Spiroans were and whether the Arkansas Basin is truly part of the Caddo Homeland. Unresolved. The view here is that the problem is a fascinating and important one worthy of additional research. Schambach's challenge to the status quo is a very serious one that should be considered carefully by Spiro scholars, not rejected out of hand. If a better case can be made for the Kitsai (or the Wichita or the Caddo), then it should be made with stronger arguments and better data than has been presented so far. That said, there may never be enough evidence of the sort needed to make definitive links between the people who lived at Spiro 600 years ago and living peoples. Two things are clear regarding the history of the Caddo peoples. One is that the Arkansas Basin and the main Caddo Homeland were home to substantially different groups of people, whether they shared a common ancestry or not. If the prehistoric peoples of the Arkansas Basin were Caddo-speakers or speakers of one of the Northern Caddoan languages, they split from the southern Caddo groups over 1200 years ago. The other, equally important point is that the two areas were linked through shared cultural elements and trade for at least 800 years. There is little or no evidence of conflict between the peoples of the two areas and much evidence of trade and the exchange of ideas. 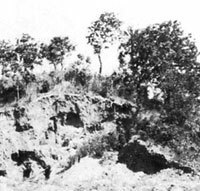 Craig Mound as it appeared in 1936 after the "Pocola miners" as the looters called themselves, were through with it. The destruction of much of this mound is one of the great tragedies of American archeology. Spiroan trade network in Mississippian times (about A.D. 1250-1450) as envisioned by Frank Schambach. 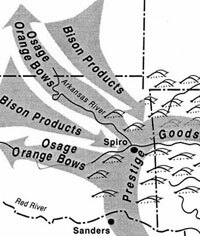 This interpretation shows bison products moving from the Plains east to the Mississippi valley, while prestige goods moved the opposite direction. Bows made of Bois d'arc (Osage orange) from the Red River valley near the Sanders site went both east and west. Courtesy Frank Schambach. Artist's reconstruction of a large house based on archeological remains uncovered at House Mound #5 at Spiro. 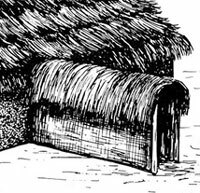 The grass-thatched roof is supported by four interior posts. The walls are made of closely spaced thin poles set within a foundation trench. Daub (dried mud) plaster sealed the walls. The extended entranceway helped keep heat from escaping in the winter. This very large house (9-x-9 meters or 29-x-29 feet) is thought to have been an elite residence, rather than an ordinary dwelling. Courtesy Oklahoma Archaeological Society. Embossed copper plate from Craig Mound, Spiro. The bird figure, identified as a peregrine falcon, has a distinctive "weeping eye" motif that appears in many falcon depictions on religious paraphernalia associated with the Southern Cult. Courtesy Robert Bell and the Sam Noble Oklahoma Museum of Natural History, University of Oklahoma. 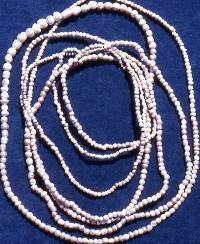 Necklaces of pearl beads from Craig Mound, Spiro. The pearls were obtained from freshwater mussels. Large numbers of pearl beads were found in the mortuary contexts at Spiro. Commercial looters were said to have amassed two gallons of pearl beads. Courtesy Robert Bell and the Sam Noble Oklahoma Museum of Natural History, University of Oklahoma. Marine shell gorgets from Craig Mound, Spiro, probably made of conch (lightening whelk) from the northern Gulf coast. These artifacts often bear elaborate iconography associated with the Southern Cult. Courtesy Robert Bell and the Sam Noble Oklahoma Museum of Natural History, University of Oklahoma. Pipe-smoker effigy pipe made of fine sandstone, with added white and yellow mineral paint. The distinctive hair style is identified by James Brown as characteristic of the shell engraving found at Mississippian sites in Southern Appalachian and Tennessee-Cumberland areas. Height and length both about 22 centimeters. Courtesy Robert Bell and the Sam Noble Oklahoma Museum of Natural History, University of Oklahoma. Click to see enlargement and side view. The ethnic/linguistic identity of the Spiroans is debated. Four possibilities have been advanced: the ancestors of the Caddo, Wichita, Kitsai, and Tunica. The problem remains unresolved. Stone earspools from Craig Mound. Some were originally covered with sheet copper. Courtesy Robert Bell and the Sam Noble Oklahoma Museum of Natural History, University of Oklahoma..